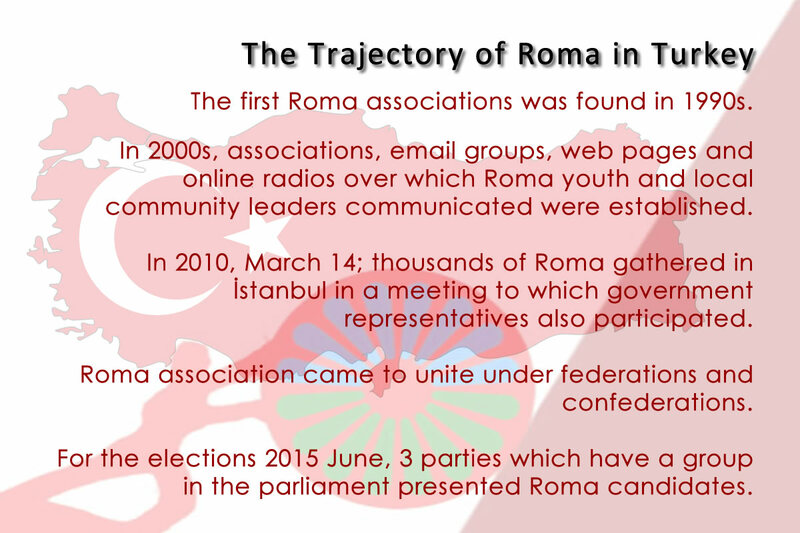 *The first Roma associations was found in 1990s. *In 2000s, associations, email groups, web pages and online radios over which Roma youth and local community leaders communicated were established. *In 2010, March 14; thousands of Roma gathered in İstanbul in a meeting to which government representatives also participated. 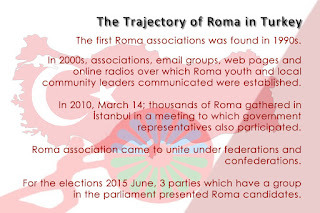 *Roma associations came to unite under federations and confederations. *For the elections 2015, 3 parties which have a group in the parliament presented Roma candidates. 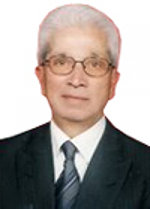 Urban renewal is an issue which is a particular concern to all citizen living in our country. 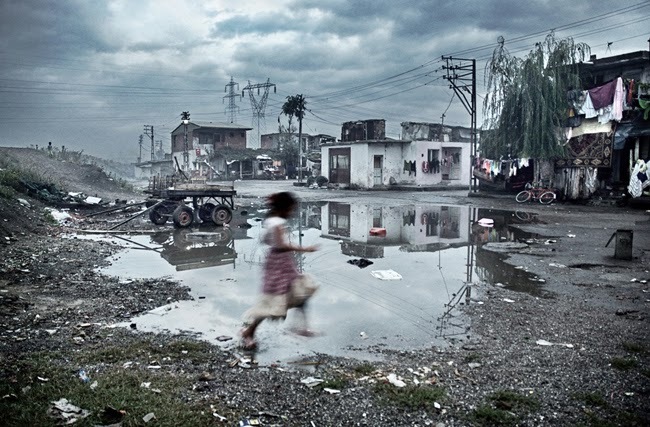 We will evaluate the issue with its dimensions regarding Roma in this article. Roma living in big metropols like İstanbul, İzmir, Ankara and settlements in Thracia, coastal Aegean, Mediterrenean region, western and central Blacksea region have been influenced by urban renewal projects in last 10-15 years. The urban renewal process will be quickened as far as it's understood from events and important results regarding Roma directly will appear. Solution of social problems is surely difficult. It's complicated and accident-prone. The ones who claim to solve social problems have to be well informed, brave, volunteer and self sacrificing. Nobody interested in overcoming of discrimination maden in written sources including humiliating discourse against Gypsies until now. I would never forgive myself if i haven't tried to solve this problem although i know it exists. I am happy that this was my opportunity to struggle against this discrimination and to be successfull largely. Here is my works and acquisitions. It's an inveterate web page. However there are cusswords in comments written under some videos uploaded to Youtube. In fact people have to be able find usefull informations about everyting instead of cusswords there. I wonder if the ones who uploaded these videos have never read these rascally comments? What is aim of the ones who publish racist speech under their videos, the ones who publish sentences like this "Kill Gypsies even their babies"? FONSECA; author and journalist. She lived between Gypsies like a Gypsy for 4 years and wrote this book. She tells the story of a forgotten society. She explains how could Gypsies survive despite they face discrimination and oppression for centuries. 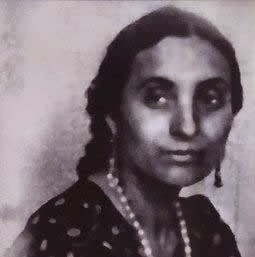 The most interesting part of the book for me is about lifestory and struggle of the Gypsy girl, Papusza. France government is carrying out a policy which is completely the most shamefull one of their history these days. You see, the "racist" leader, i am using this adjective without any doubt, is deporting Roma people from his country. As if Roma went there because they like the country too much. Roma are "stormy petrels" and "ramblers" and his deportation policy is a kind of national war according to Sarkozy. He started the same national war against Algerians, Tunusians and Turks before. Tenth day of the month of Ramadan. The weather is too hot. We are speaking with Ali on sea view balcony of coffee house. We are trying to become cooler there. Although everybody is fasting in our neighbourhood in the month of Ramadan, the coffeehouse is open in afternoon. Some of the resident go to garden of the mosque. Some others go to the balcony. So the conservation of residents continues. Moreover, in winter Ramadans, the coffeehouse owner burns stove and people gather around it altough he doesn't sell anything.